‘America’ was wild-hatched in the Tongass National Forest, Alaska. As part of a reintroduction program, he was removed from his nest at eight weeks of age, placed in a hacking tower in Tennessee, and released into the wild. Soon after his release, he was found shot in his left wing. After healing from his wounds in rehabilitation, he was once again released into the wild at Reelfoot Lake. America crossed the Mississippi River into Missouri and remained close to a farm for days. The owner of the farm observed that America was not catching any food, because he simply could not fly well enough, even after rehabilitation. He was recaptured and placed in the care of the American Eagle Foundation. 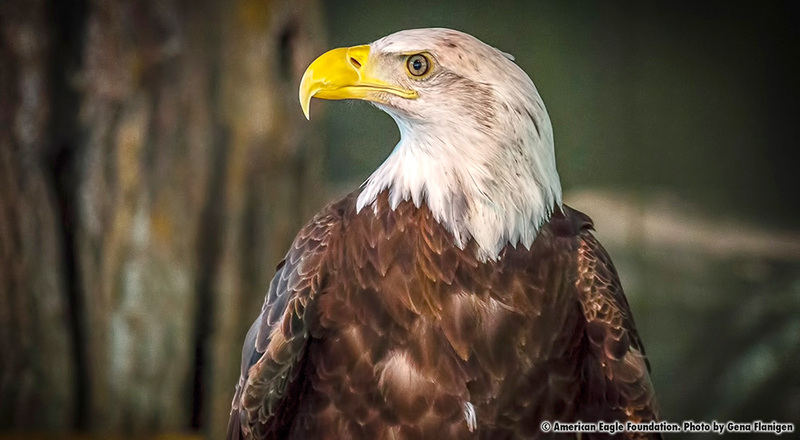 Bald Eagles were placed at the center of the Great Seal of the United States in 1782! Since then, they have served as the pride of America’s skies and the symbol of all that America stands for. Bald Eagles obviously aren’t bald! “Bald” in this sense refers to an old English word that means “white headed.” When eagles fledge the nest at between 10 and 13 weeks of age, they are primarily all brown. An Eagle gets its full white head and tail feathers and yellow beak and eyes at around four to five years of age. 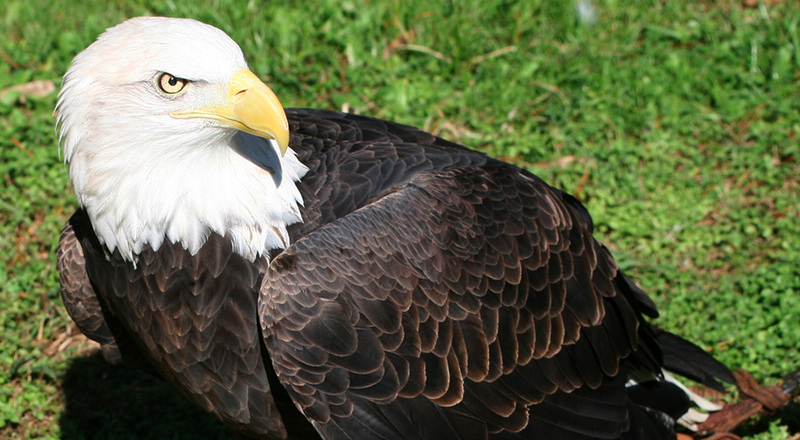 Bald Eagles typically mate for life. Usually, they will only look for a new mate if their faithful companion dies, but sometimes a new mate is chosen in a territorial fight over a nest. 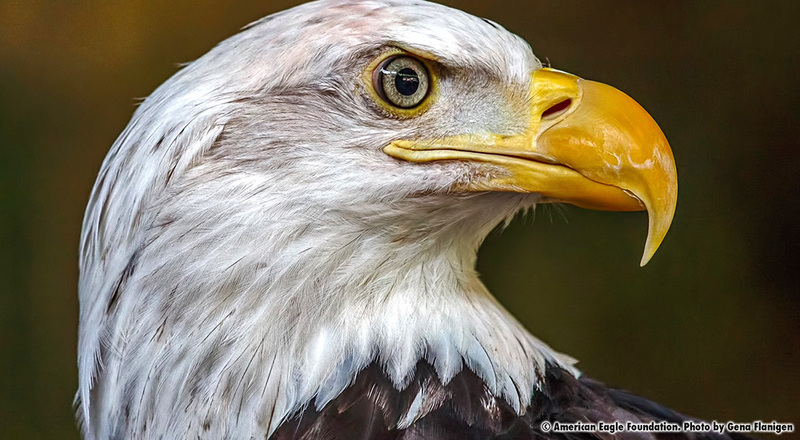 In building a nest, Bald Eagles will choose a ‘super-canopy’ tree—one rising above the rest— near to water, with sturdy limbs and a commanding view of the surrounding terrain. Typical nest heights are 50-125 feet high. They make use of twigs, grasses, soft mosses and feathers in making their nests and normally return to the same nest each year during breeding season and add new materials to it. A new eagle pair’s nest usually measures about five feet in width and two feet in depth. As they add to it year after year, however, it can reach widths of over ten feet and weigh up to a ton or more. On the Channel Islands, where large trees are very scarce, Bald Eagles have built their nests on cliffs; and, in some coastal areas of Alaska and Canada where there are few tall trees, Bald Eagles will nest on the ground, using whatever materials are available.